Whether getting your home ready to sell or not, exterior updates are just as important as the interior when trying to create an inviting property for guests and potential buyers. But often cleaning up and refreshing after a long winter can seem overwhelming and costly. 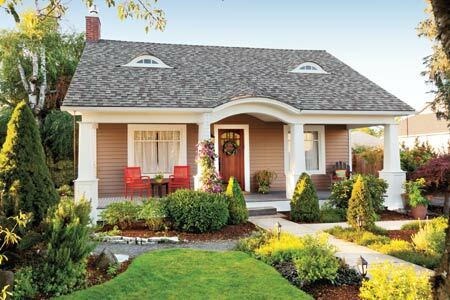 Therefore, we put together the following checklist with simple, inexpensive ways to instantly add curb appeal and get your home noticed on a limited schedule and budget. Start with some basic clean up — give your home’s siding a good power wash, touch up trim with fresh paint, remove debris from gutters, repair cracks in driveway/walkway and spread fresh mulch in beds. Remove dead shrubs, prune bushes, weed and add pops of color with new annuals. Assess the condition of your lawn and decide whether to reseed or add sod if uneven and patchy. Add a generous layer of natural mulch to beds to complete the whole look. Update the front porch with a fresh coat of paint for the front door, bright accessories such as a beautiful welcome mat, potted flowers and plants in urns, colorful accent pillows placed on a bench and finish with a floral wreath for the door. Clean off debris by power washing deck, replace broken boards and refinish if necessary. You’ll then be ready to layer on fresh accessories and decor — lanterns, throw rugs, umbrellas, garden stools, and plastic dishware is all that is needed to create a party-ready patio for summer. Click here to visit our “Curb Appeal” Pinterest board for ideas that will give your home’s exterior a welcoming feel and make a great first impression.